We are pleased to release our Annual Report 2016/2017, which shares highlights of what we have accomplished together in the first year since launching our Strategic Plan 2016-2019 at our Annual Conference in May 2016. Building the sustainability of the association. Check out the annual report here! 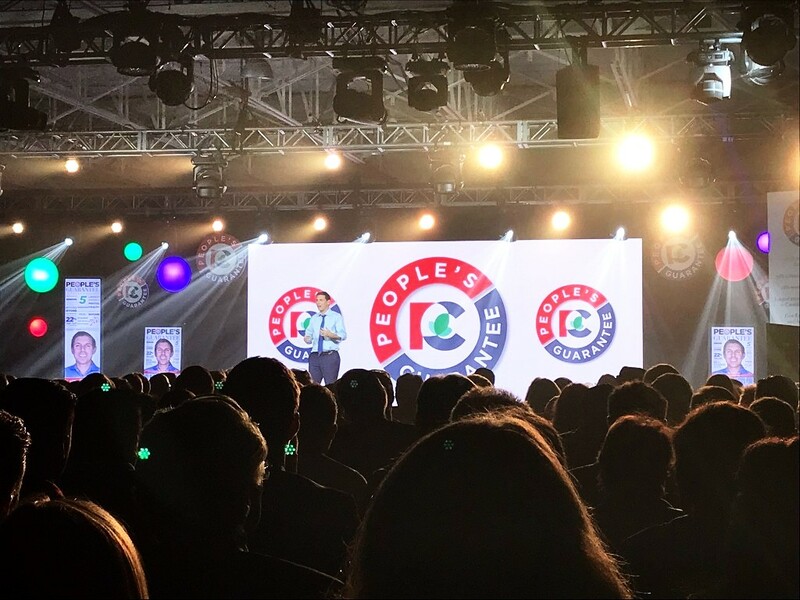 At the party convention November 25 in Toronto, the Ontario PC's committed to matching the federal health transfer for mental health. The $1.9 billion commitment was listed as one of leader Patrick Brown's 5 key platform planks. The Ontario PC's have promised to "devise a comprehensive mental health system," with funding directed towards key priorities such as children and youth, expanding the COAST pilot project, investing in mental health services, including suicide prevention counselling, as well as data collection to identify and fill gaps in care. AMHO welcomes this significant commitment to invest in mental health, and has been assured that addiction will be included. 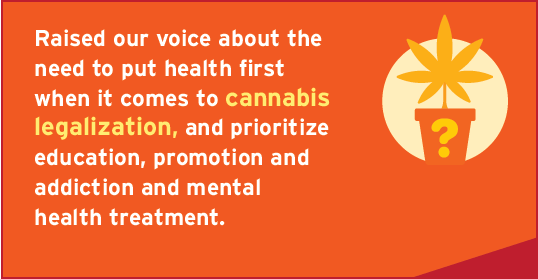 We encourage all major political parties to bring forward bold commitments like these in mental health and addiction. Deadline approaching to submit your proposal! The December 15 deadline for agencies and networks wishing to submit a Youth Wellness Hub proposal is fast approaching. This is an important opportunity for our youth serving agencies to partner and improve access to services and supports for Ontario’s young people. YWHO is the new entity that has been created to deliver on the government's commitment to support up to nine integrated service hubs for youth. At these hubs, young people between the ages of 12 and 25 will be able to receive walk-in mental health and substance use services, as well as other health, social, and employment supports all under one roof. More details about the program and the application process is available online here. 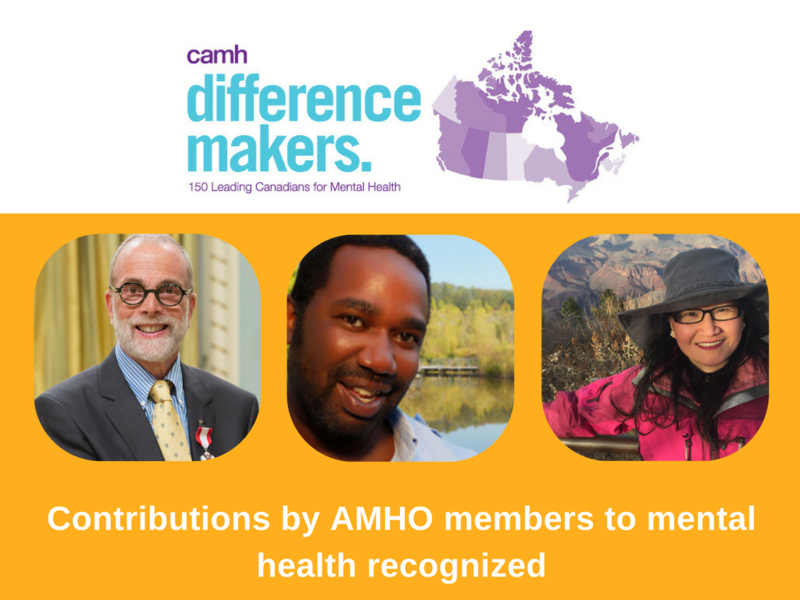 AMHO is pleased to share that three of our members have been recognized as difference makers in mental health! We share excerpts from their stories below, all of which demonstrate the importance of community services and the people who work everyday for a better system. Steve Lurie, CEO of CMHA Toronto and AMHO board member, is recognized for his advocacy around the urgent need for increased funding for mental health and addiction services. As the article states: "in the chorus of voices calling for increased funding for mental health services, one often stands out." We are grateful to have Steve's strong voice on our Board of Directors. Shawn Pendenque is a peer support worker at LOFT Community Services, where he uses his lived experience navigating significant life changes to help others change their lives. As someone young clients can relate to because he has literally walked their path, to date Shawn has facilitated more than 568 recovery groups. Liping Peng has been a social worker with Hong Fook Mental Health Association for 16 years. From introducing new initiatives at Hong Fook to vastly expanding their reach by growing an effective volunteer program, Liping has been relentless in her efforts to support mental health in the Chinese community. It was great to see many other AMHO partners and colleagues recognized, including Asante Haughton, who spoke at our Annual Conference last spring, fellow member of the Mental Health and Addiction Leadership Advisory Council Eric Windler, Alicia Raymundo, Kwame McKenzie, and many others! Check out the 150 leading Canadians for mental health here. On November 17, the Excellence Through Quality Improvement Project (E-QIP) and Addictions and Mental Health Ontario joined teams and organizations across the province to celebrate the culmination of the Change Day campaign. Thanks to your participation, there were over 200 Change Day pledges from the mental health and addiction sector! 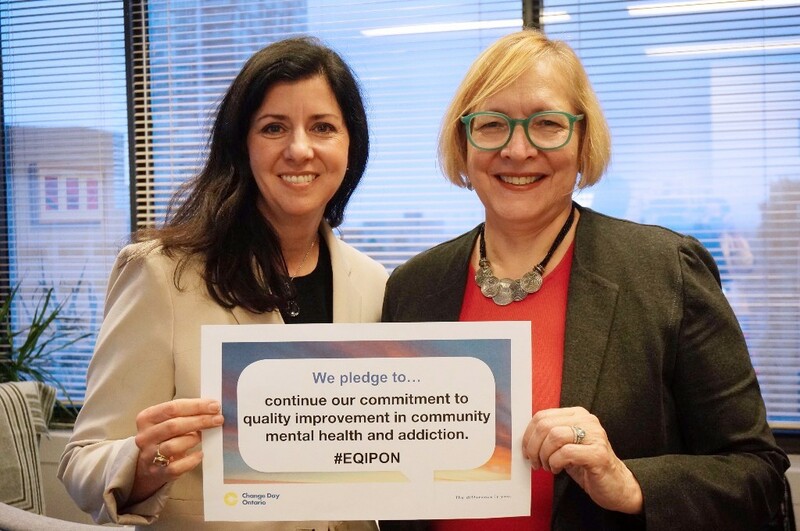 Our CEO, Gail Czukar, and Camille Quenneville, CEO of CMHA Ontario, together pledged to continue their commitment to quality improvement in community mental health and addiction through E-QIP. To date, E-QIP has provided more than 2,000 participants with quality improvement training, supported 29 organizations with coaching and support, and provided 404 community of practice members with access to quality improvement resources. Visit ChangeDayOntario.ca to see more pledges, and we look forward to next year's campaign! Ontario's new labour legistation, the Fair Workplaces, Better Jobs Act received royal assent this week, and some of its provisions go into effect as early as January. AMHO is supportive of the increase to the minimum wage, as our members see firsthand the impact that low wages, inadequate housing and other economic factors have on people’s mental health and addiction outcomes. Investments in the social determinants of health improve lives and communities, and we wholeheartedly support poverty reduction measures such as increasing the minimum wage. However, we are concerned in some instances about the impact these wage increases may have on Ontarians’ access to mental health and addictions services and supports. In a recent survey of AMHO members, 42% of agencies indicated that they believe that the proposed minimum wage increase will result in reduced care to clients. Finance Minister Charles Sousa indicated in the fall economic statement that the province is committed to working with “those in the broader public sector and the not-for-profit sector, to help ensure they successfully manage the transition.” In order to avoid any negative impact to client care, AMHO has been calling on the province to commit to funding resultant service delivery cost increases. AMHO will be working with our members to provide further advice to the province on how to avoid the potential negative impacts to client care, and to manage the transition. Thank you for making our Fall Community of Practice and AGM a success! Our Fall Community of Practice meetings, AGM and Leadership Forum brought together over 120 individuals from across the sector and across the province earlier this month. Thank you to everyone who attended and made the event a success! We look forward to seeing you at our annual conference downtown Toronto May 27 to 29, 2018. Sign up for the Peer Knowledge Exchange Event December 6 in Mississauga. Nominate a thriving peer support program for a research study by December 15, 2017. Participate in the next TGS Webinar on 'Men, Boys, Trauma and Substance Use' on December 8, 2017 at noon Eastern. Submit a proposal for Waypoint Research Insititute's Annual Conference by December 20, 2017. Now available: our Annual Report 2016/2017! Thanks for making our Fall CoP a success! 6th Annual Addictions and Mental Health Conference - CALL FOR PROPOSALS COMING SOON! Addictions and Mental Health Ontario (AMHO) represents over 220 addictions and mental health organizations in Ontario. As the collective voice of our members, we provide leadership and engage partners to build a comprehensive and accessible system of addictions and mental health care, and improve the well-being of individuals, families and communities in Ontario. Copyright © 2017 Addictions and Mental Health Ontario, All rights reserved.